Veterinary Ophthalmology Orlando | Animal Eye Clinic Maitland | Animal Eye Specialists FL - Animal Eye Associates, P.A. Animal Eye Associates was founded in January of 1992 by Dr. Daniel Priehs. Originally located in Winter Park, we moved to Maitland in 1998 after construction of a full service referral center and association with Affiliated Veterinary Specialists. To accommodate our growing needs in 2004 we built our current animal eye clinic facility, which is shared with Veterinary Dermatology Center and adjacent to Affiliated Veterinary Services. Dr. Heidi Denis joined Animal Eye Associates in 2001, and Dr. Melanie Church followed in 2014. Dr. Caryn Plummer, Service Chief of Ophthalmology, University of Florida Small Animal Hospital occasionally sees patients at our Maitland office. On March 23, 2015 we opened our second full service hospital in the Waterford Lakes area, where we share a facility with Affiliated Veterinary Specialists and The Veterinary Emergency Clinic of Central Florida. Over the years, our animal eye specialists have been privileged to serve the Central Florida veterinary and pet-owning community, providing the highest-quality eye care to our patients. 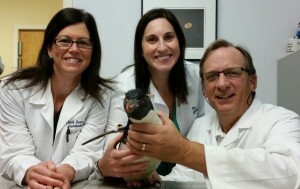 In addition to the traditional pets, we also work with Sea World, Walt Disney World, Central Florida Zoo and Florida Audubon Society to address their animals’ eye care needs. Animal Eye Associates has had a long association with Canine Companions for Independence, donating our professional veterinary ophthalmology services for these highly trained assistance dogs. When you visit one of the Animal Eye Associates offices in Maitland or Orlando, Florida, we’ll do everything we can to make sure you and your beloved pet feel comfortable. We specialize in the diagnosis, treatment, and care of eye problems in a variety of animals, and if we can’t assist you we can point you to someone who can. If you’re a brand new client of ours, learn what to expect when you visit our veterinary ophthalmology office or contact our team to make an appointment. As Maitland and Orlando’s Top Rated Local® veterinary ophthalmologists, we offer comprehensive eye exams to animals of all species. If you’re concerned that something may be wrong with your dog, cat, or other pet’s eyes, our staff is more than happy to thoroughly examine the optical health of your pet before recommending the best veterinary treatment solution. As one of Florida’s top animal eye clinics, Animal Eye Associates is proud to offer diagnostic eye testing for a variety of pets and animals at our veterinary clinics. If you’re concerned that your pet may be suffering from an eye issue, schedule an appointment with our team of veterinary ophthalmologists today. As a pet owner, it can be a challenge trying to diagnose eye problems in your pet. If you’ve started to notice things like discharge, uncontrollable tearing, or cloudiness in your pet’s eyes, we recommend bringing them to one of our veterinary offices right away. At Animal Eye Associates, we specialize in animal eye surgery, whether it be for a dog, cat, or other household pet. Our team is specially trained to recognize common eye conditions like cataracts, glaucoma, conjunctivitis, corneal ulcers, and more.